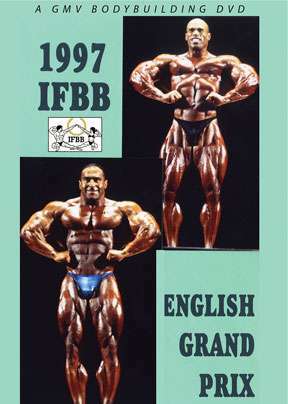 KEVIN LEVRONE claimed his victory at the English Grand Prix, held in Nottingham, England just one week after the 1997 Mr. Olympia. This video includes every comparison and call out of Rounds One and Two, as well as the posing in Round Three. And of course, it also features the magnificent posedowns and final awards. We do not have Paul Dillett in many DVDs and in this one he really shines. DVD footage of Jean Pierre Fux is also quite rare as his career was cut short by his terrible injuries. This contest was historic in regard to Ronnie Coleman who placed 5th. One year later he was the new Mr. Olympia, and as far as we know, Kevin Levrone never placed above Ronnie again.